As they say you can’t have suburbs in Oregon without Escallonia. Its a prerequisite. And they are incredibly tough, useful shrubs. Drought adapted, they have glossy evergreen leaves and grow moderately fast. This dwarf variety is conveniently small. Compact and dense growing to only 2′ x 3′ in 7 years. 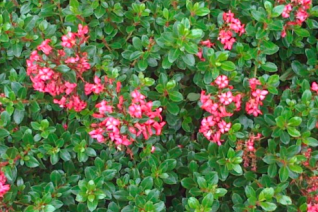 The glossy leaves make a fine backdrop to the clusters of small red/pink flowers that come in abundance in early summer but also sporadically year round. Incredibly drought adapted when established sailing through a whole dry summer without suffering one bit. 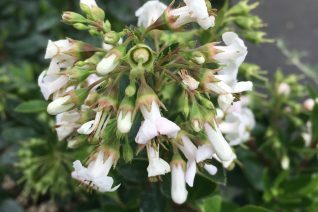 Avoid exposure to subfreezing wind with this shrub it can burn- but as with all Escallonia recovery is mind bogglingly fast in spring. Loved by hummers and bees and pollinators in general. Very easy to go grow and always looks good. Moderate deer resistance. Chile. 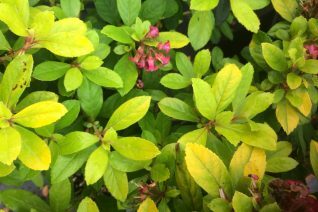 Brilliant gold shrub that lights up borders and makes a pretty showy hedge as well. In late summer sporadic hot pink small flower clusters provide added contrast. Tough evergreen for nearly any soil type. Drought adapted. Foliage does not burn in full sun- in fact it takes the hottest aspects. Fast growing to 4′ x 5′ in 4 years. Cold hardy to about 5ºF- but has recovered from the roots from below 0ºF Native to Chile. Takes well to pruning. Excellent performance at the Oregon Coast.